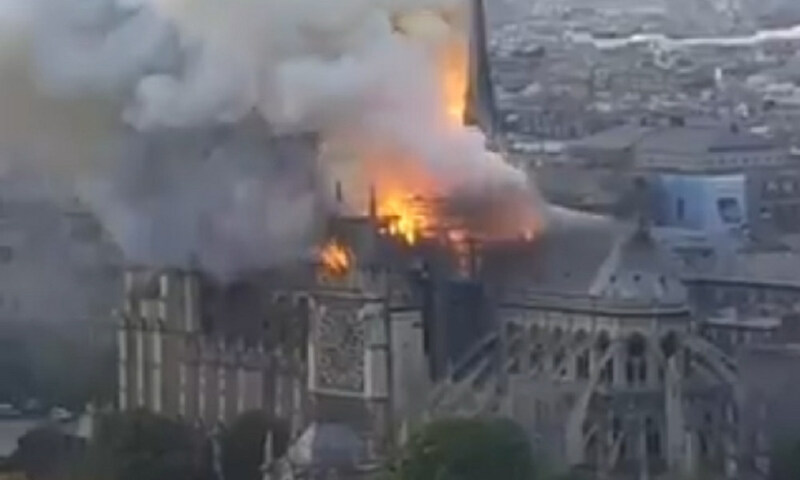 A large fire has erupted at the Notre-Dame Cathedral in Paris, causing massive damage at the centuries-old landmark, officials and witnesses say. The main spire and a part of the roof have completely collapsed. The blaze began at 6:50 p.m. on Monday and is concentrated on the roof near the bell towers, where renovation work was underway. A part of the roof collapsed and the fire spread to the main spire, causing it to collapse about an hour later. Hundreds of firefighters were called to the scene as large crowds gathered in the surrounding area to watch the fire, which was brought under control by 2 a.m. on Tuesday. Areas close to the cathedral have been evacuated. Paris Deputy Mayor Emmanuel Gregoire said the building suffered “colossal damages,” but city officials believe the main structure has been saved from total destruction. Artwork which was stored at the cathedral has been secured. French President Emmanuel Macron, who was due to address the nation on Monday night, canceled his speech and traveled to the scene of the fire. Talking to reporters, he pledged to rebuild Notre Dame and said he will be seeking international help to do so. To watch French TV coverage in English, click here for a live stream.